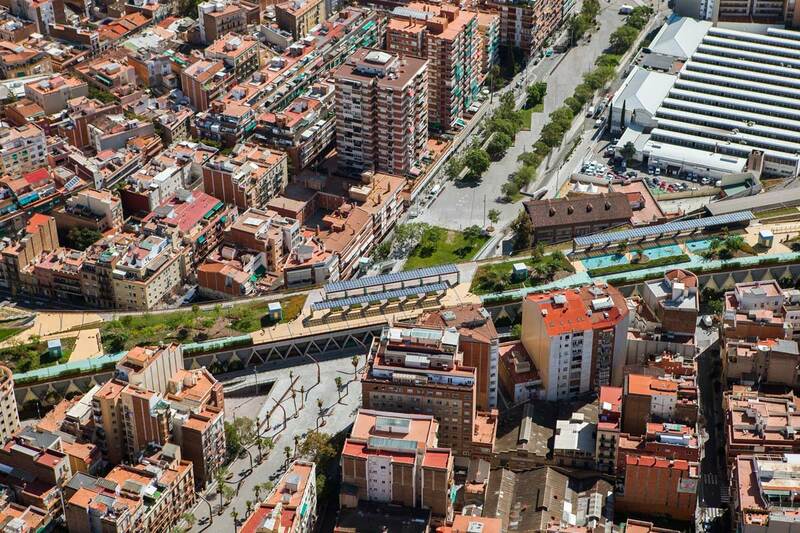 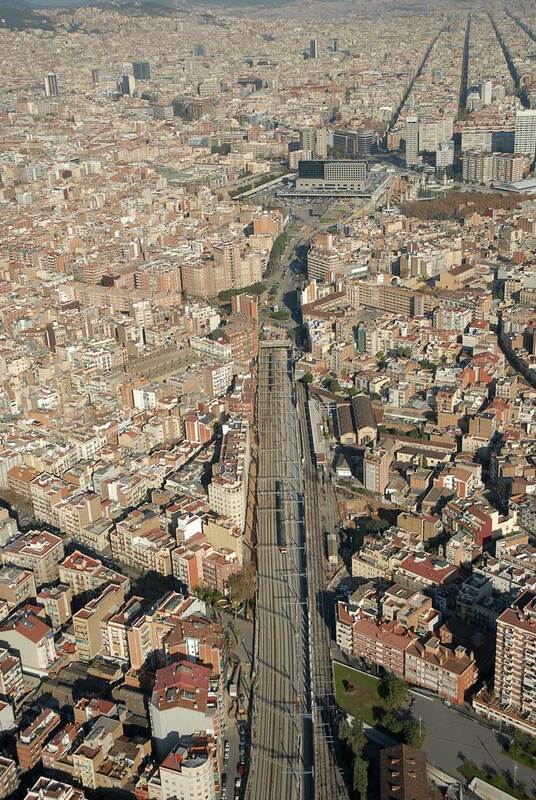 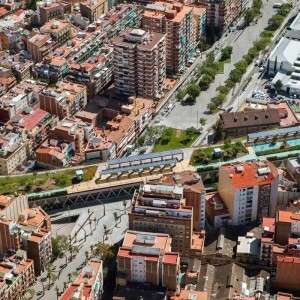 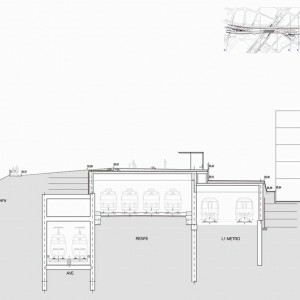 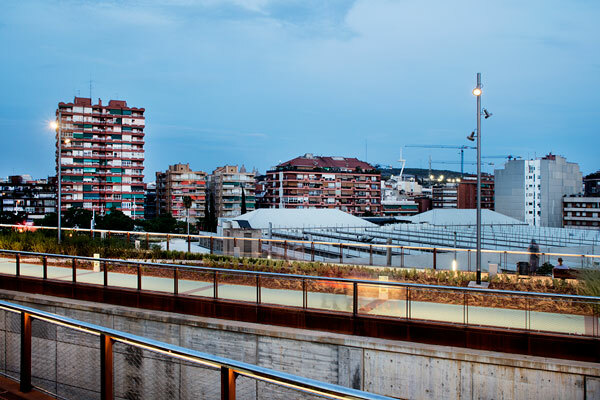 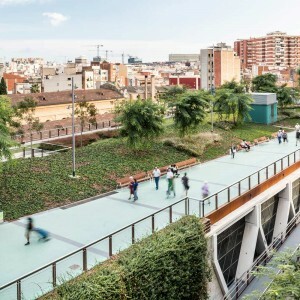 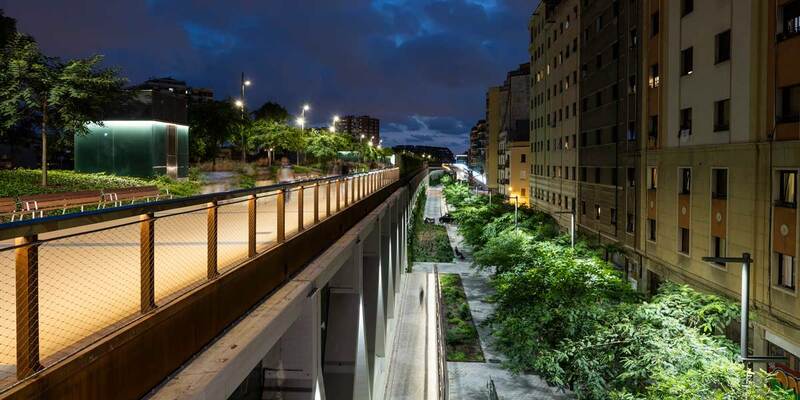 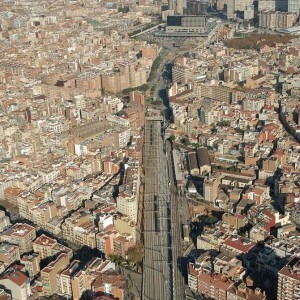 The train and subway routes in Sants neighbourhood, Barcelona, has opened a wound in the urban fabric during the last century. 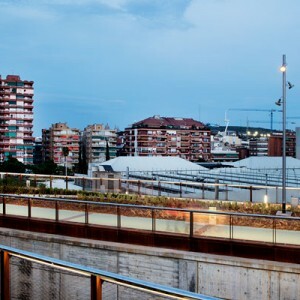 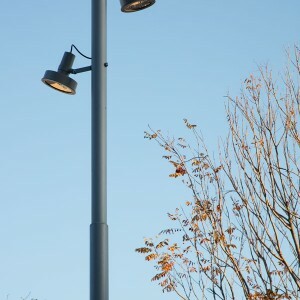 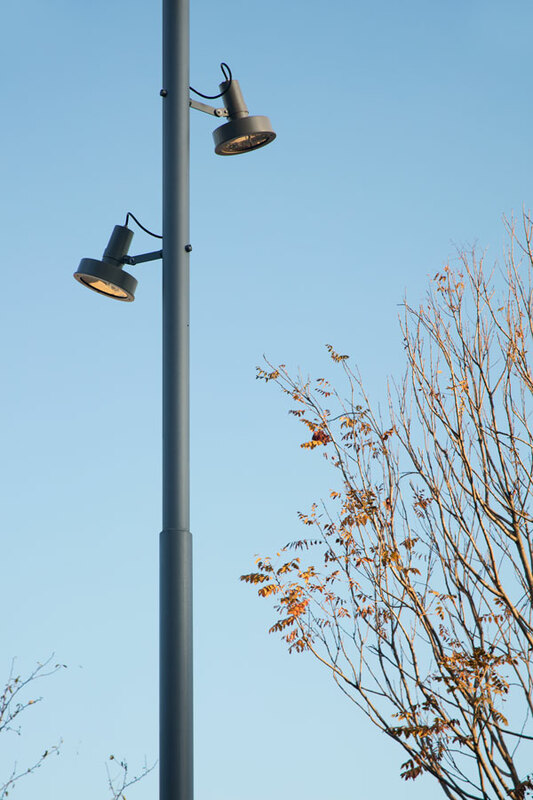 With an average width of 30m and an 8-way platform, the infrastructure has divided the neighbourhood in two separated parts, along 800m generating urban dysfunctions in terms of noise pollution and degradation of its surroundings. 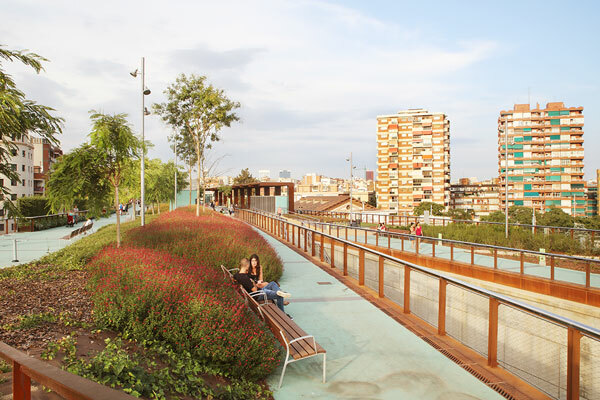 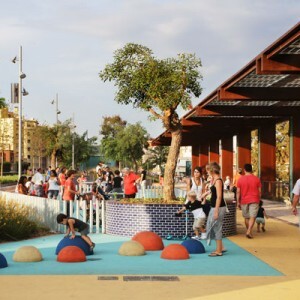 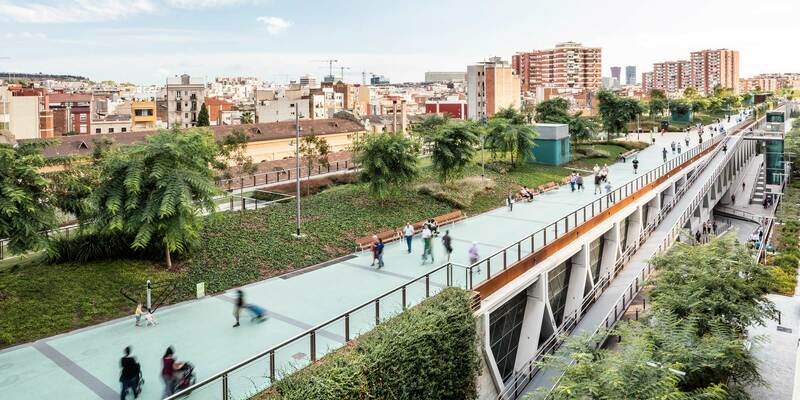 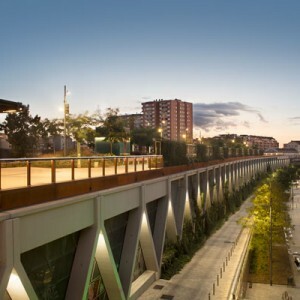 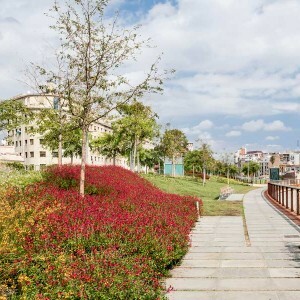 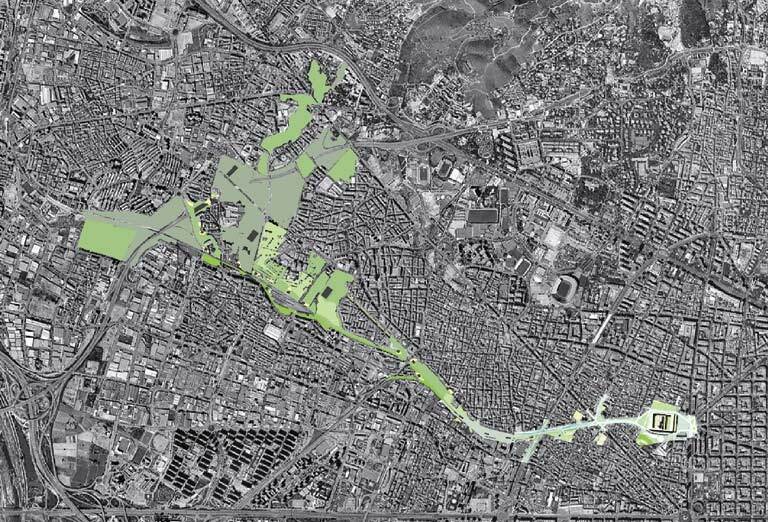 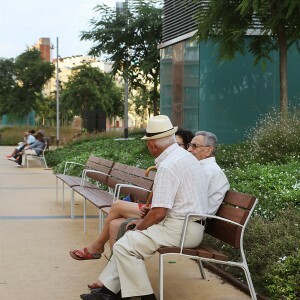 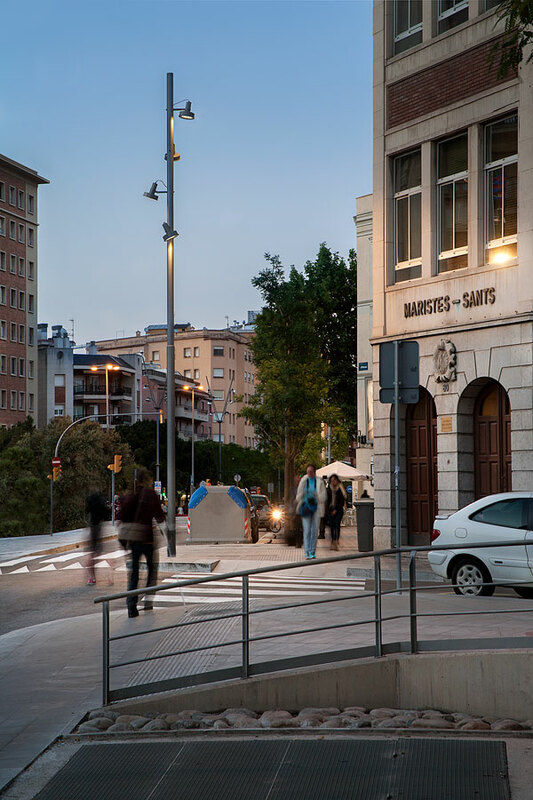 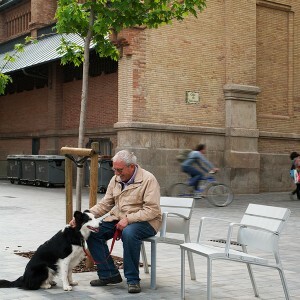 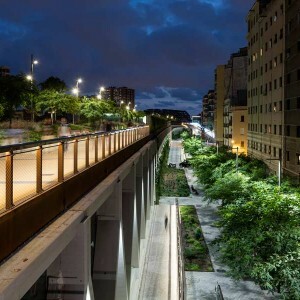 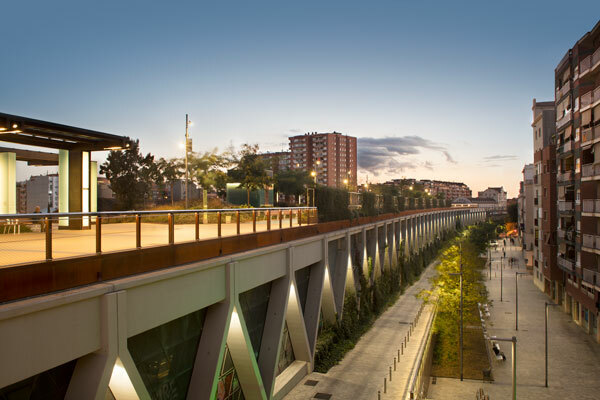 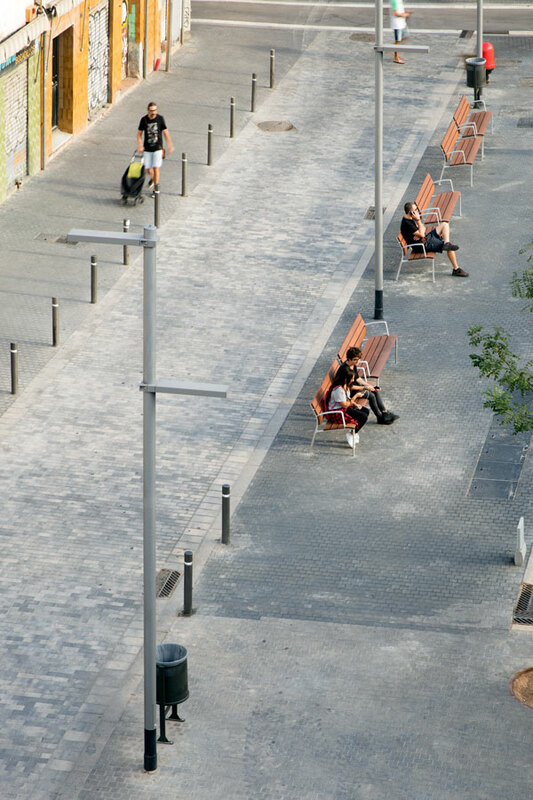 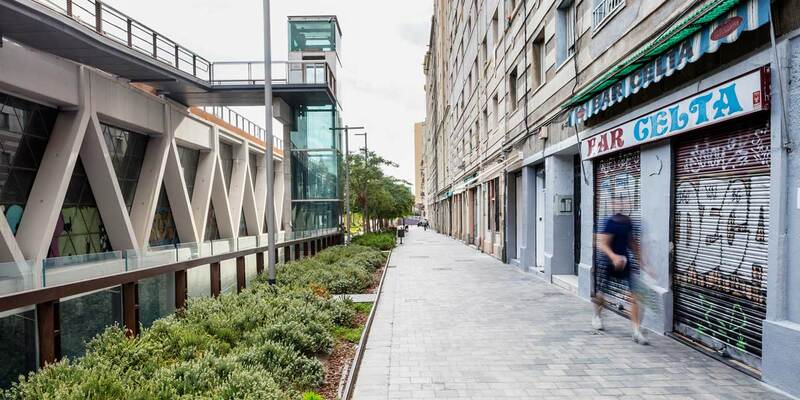 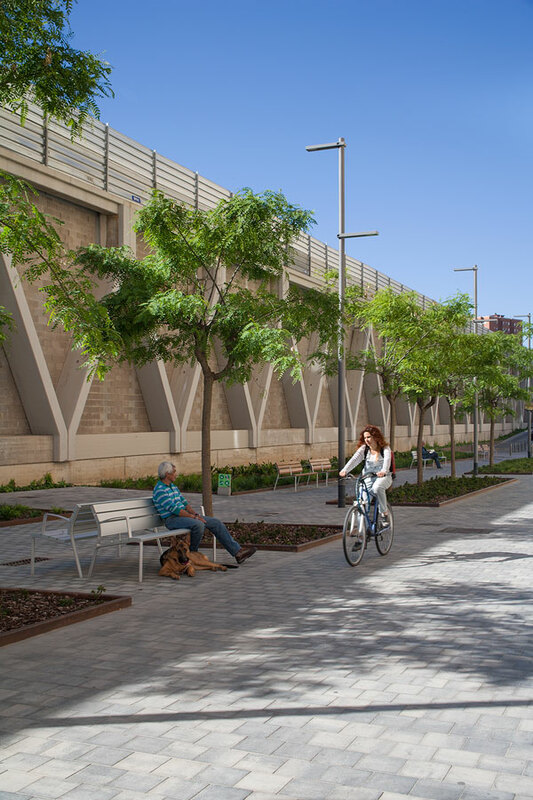 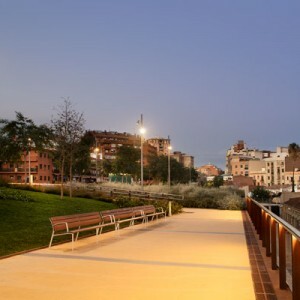 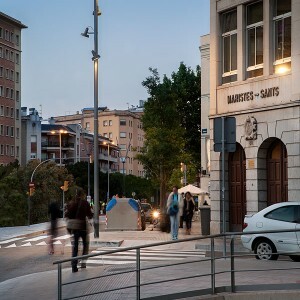 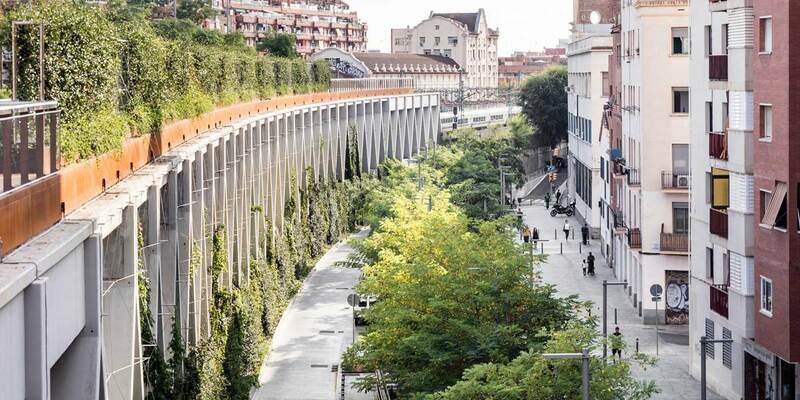 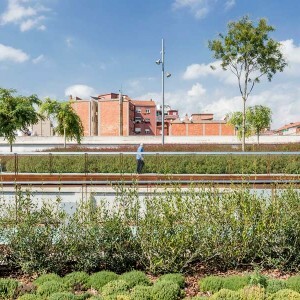 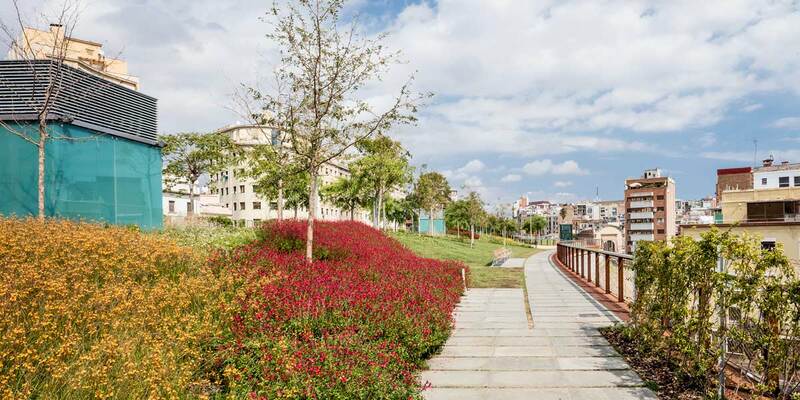 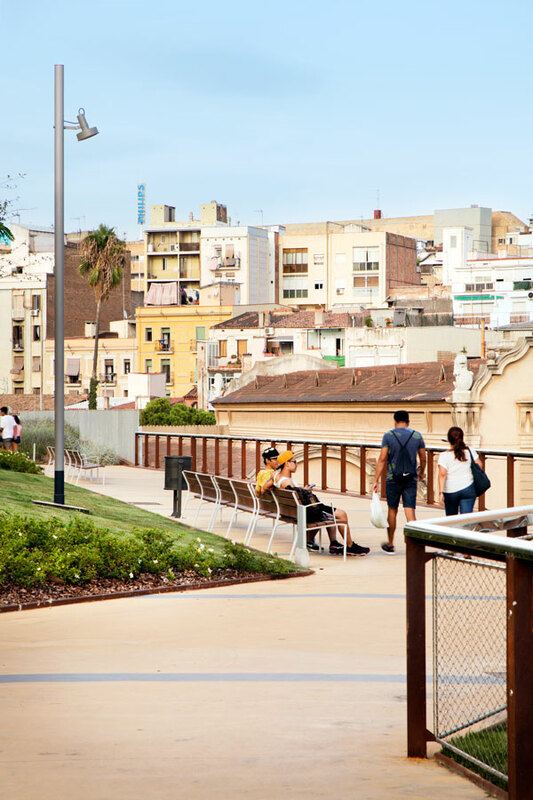 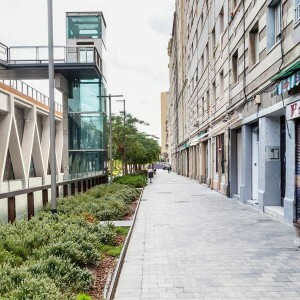 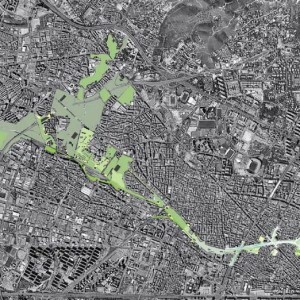 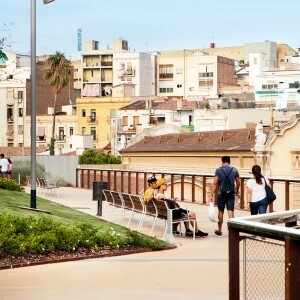 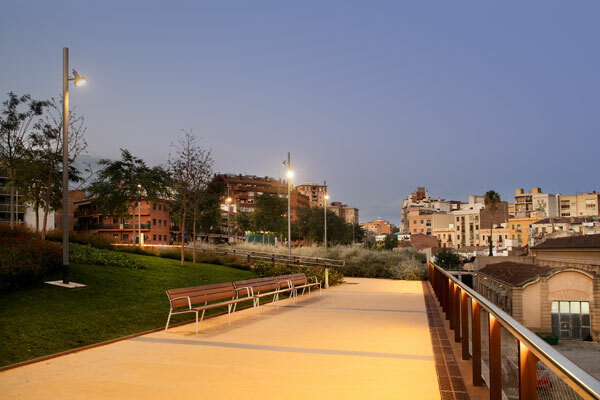 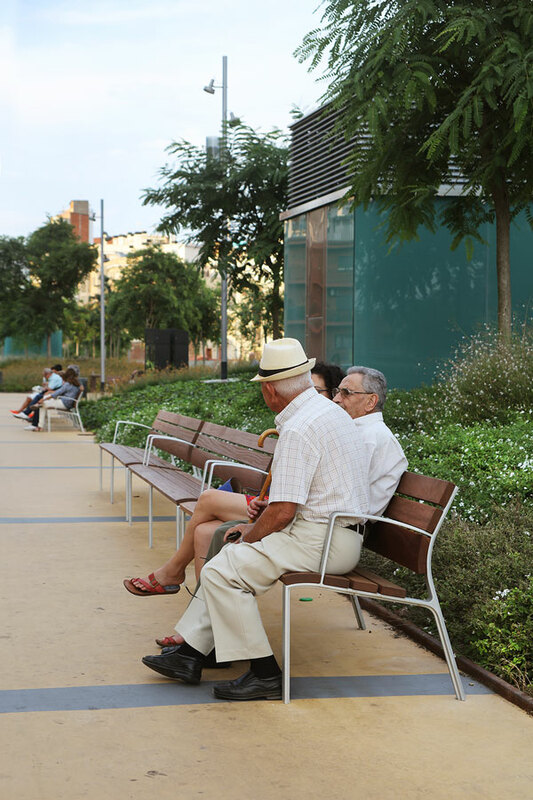 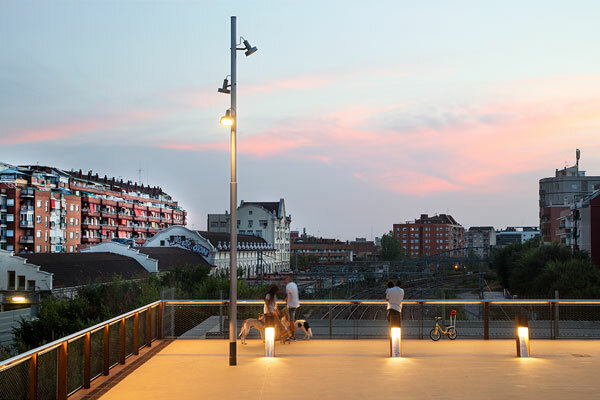 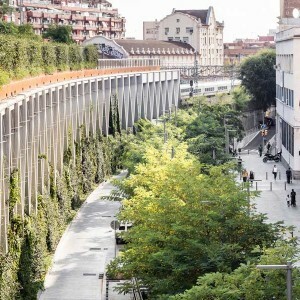 In 2002 the city administration decided to start up an urban renewal project of Sants railway corridor, starting a complex process that involved three public administrations and a civic associations of Sants district. 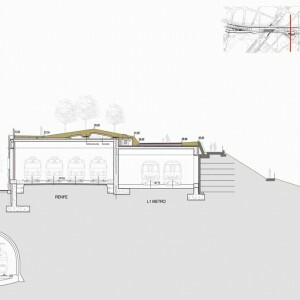 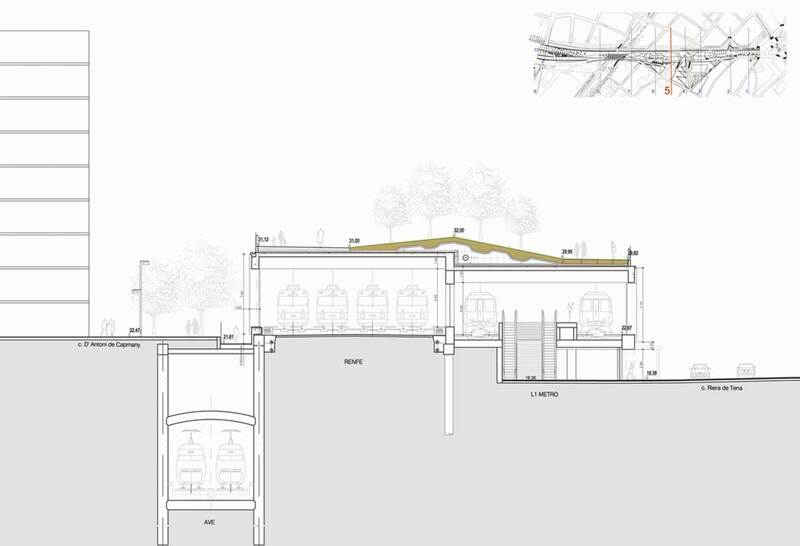 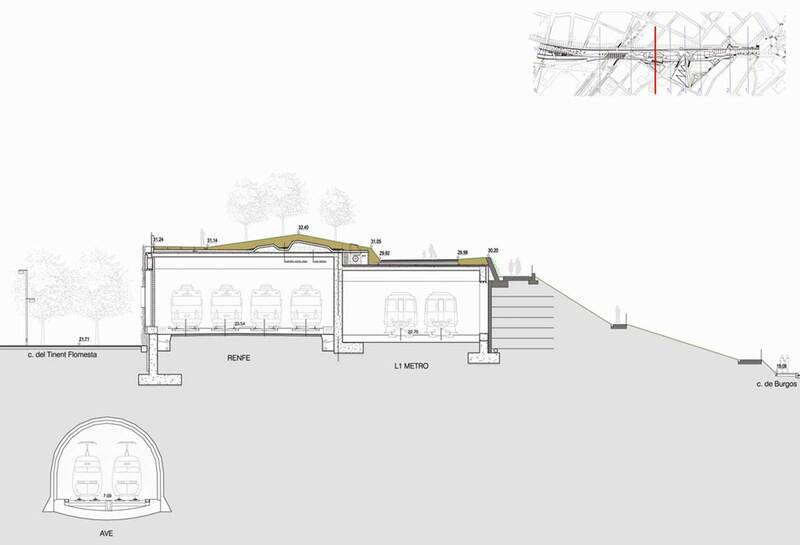 The final proposal was to create a transparent box where to confine the railway in order the roof to be transformed into 800m elevated garden. 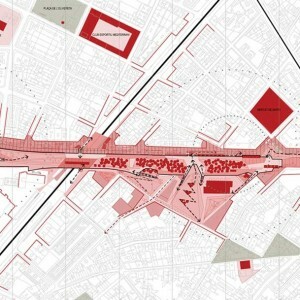 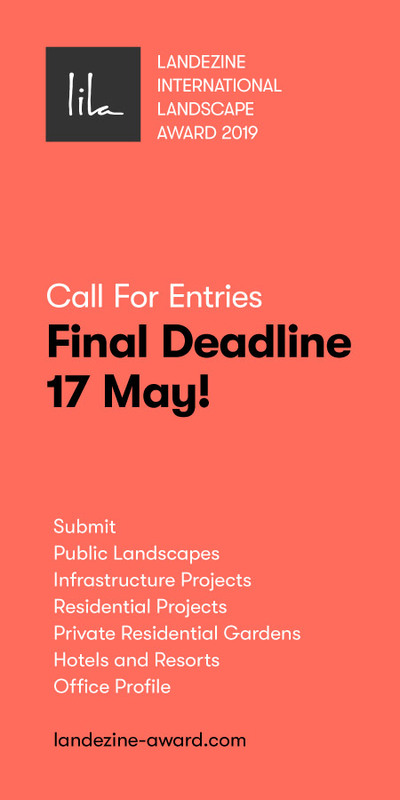 The previous idea of bury the infrastructure has been discarded due to technical and economic problems. 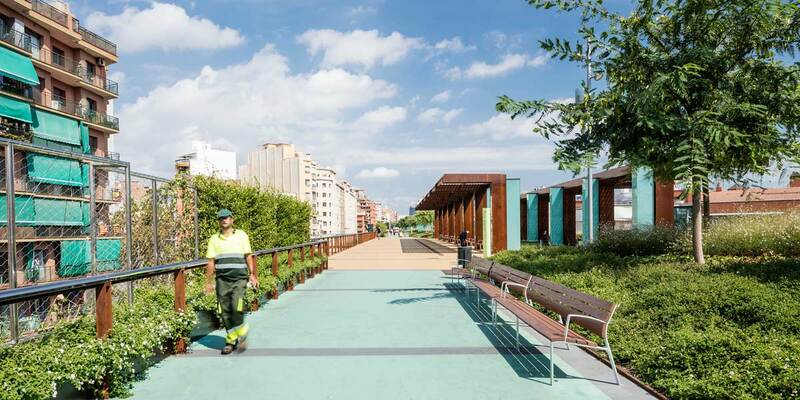 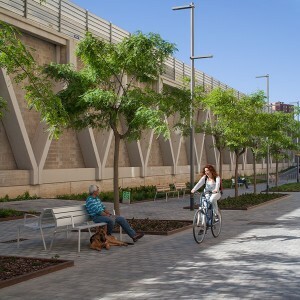 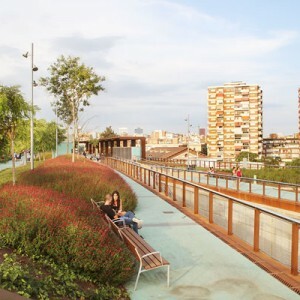 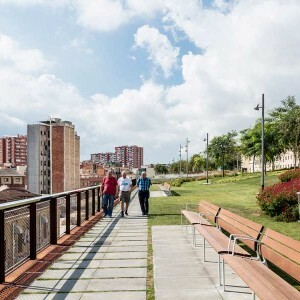 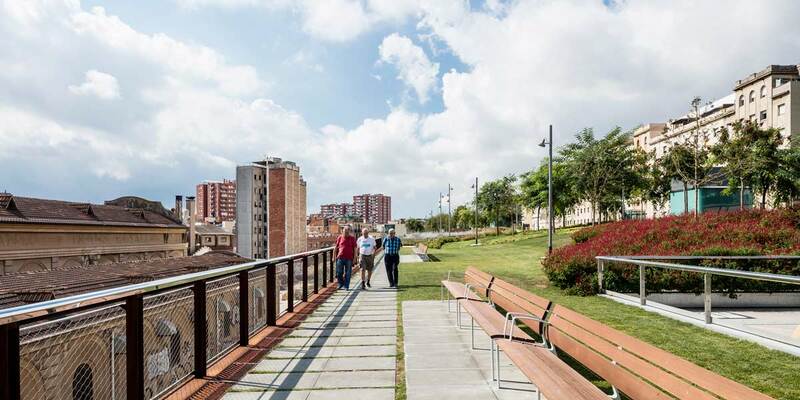 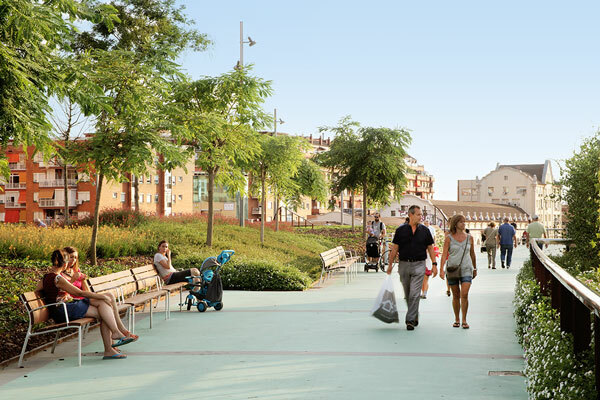 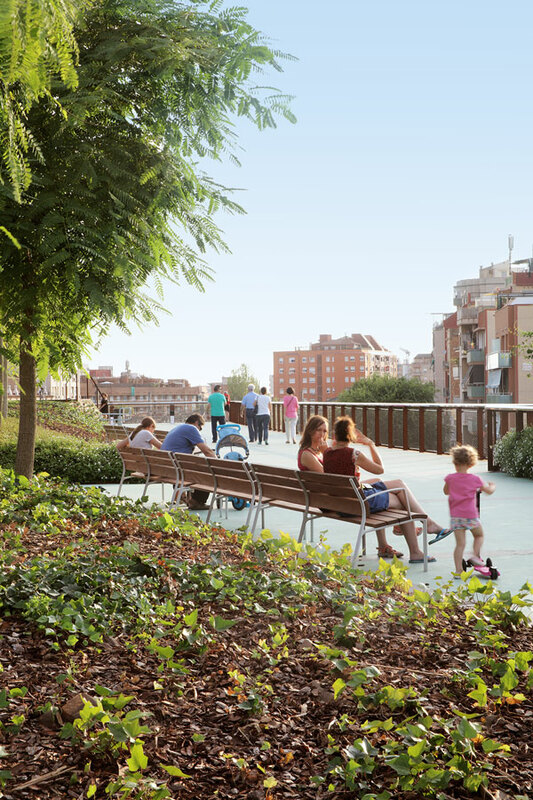 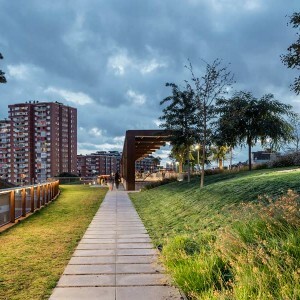 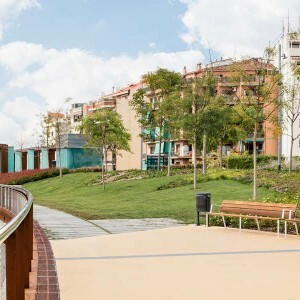 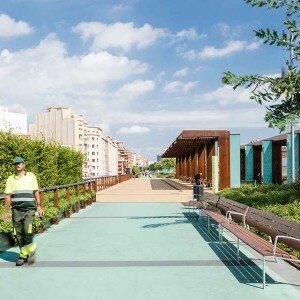 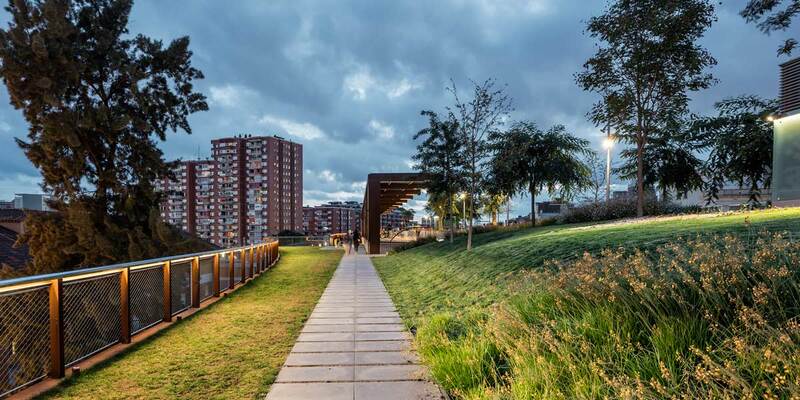 The path would be extended later in the neighbouring municipalities: Hospitalet, Esplugues and Cornella, a 5km “green corridor”. 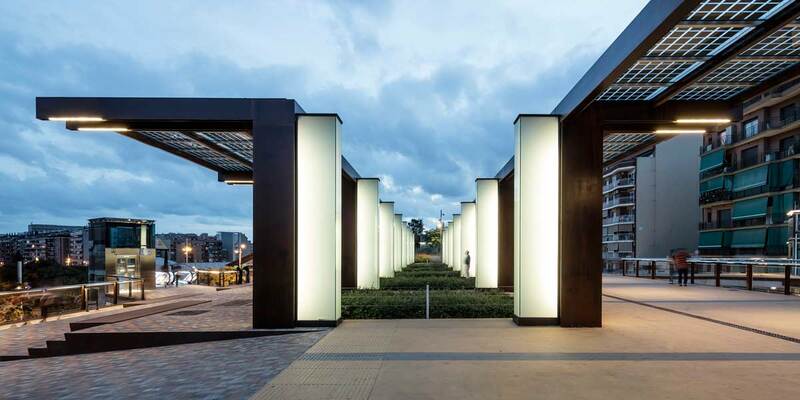 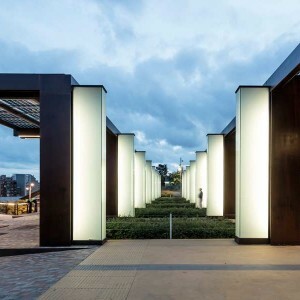 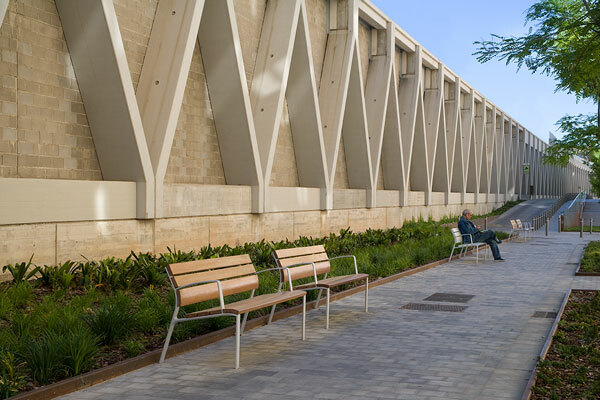 The support structure of the building is made up in prefabricated concrete with diagonal beams looking like the Warren beams, that evokes the old railway bridges, allowing the vision of the train passing through the city, minimizing its acoustic impact. 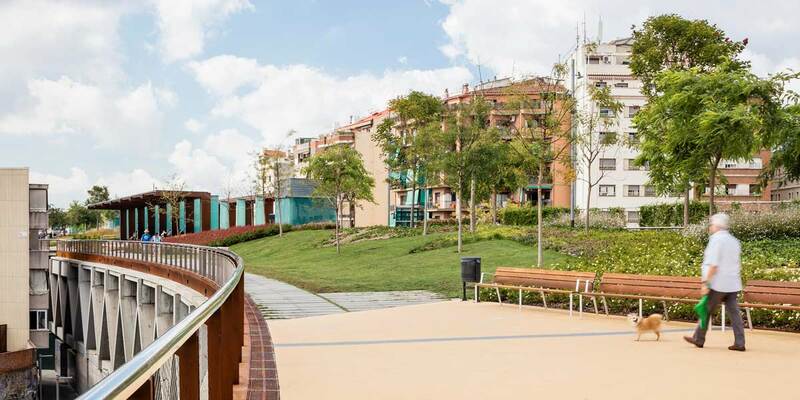 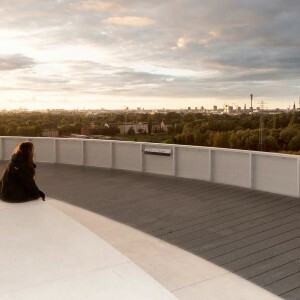 The roof of the building is elevated 4-12 meters compared to the surrounding streets in order the garden become panoramic viewpoints. 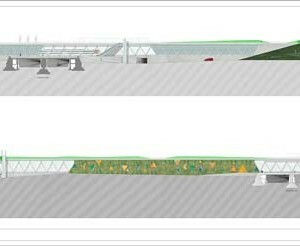 The gardens are structured in two linear paths: one on the north side of the deck. 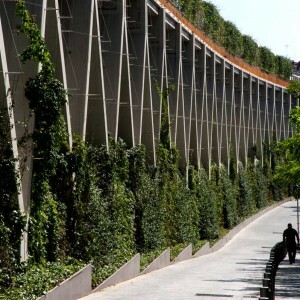 very shaded by the trees and another on the south side. 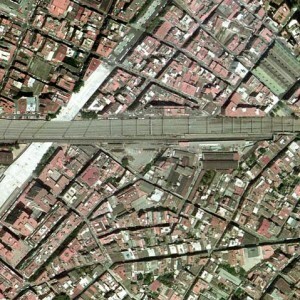 permanently sunny. 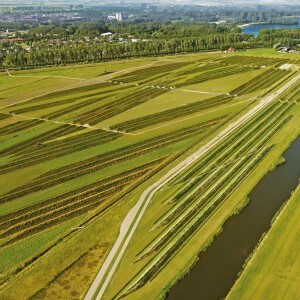 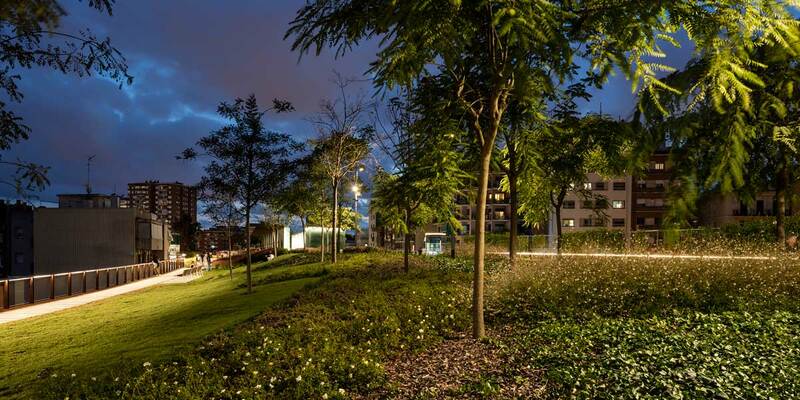 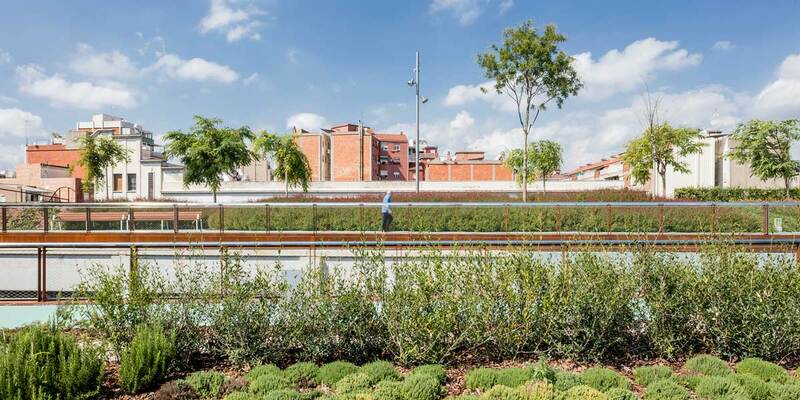 The space between the two paths is configured as the backbone of the gardens based on a complex artifICial topography with a high density of trees and a rich plantation of shrub and upland vegetation selected according to a very specifIC color palette. 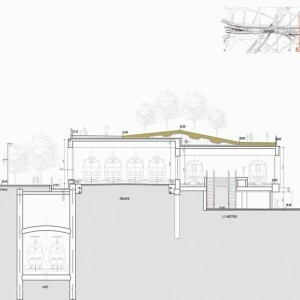 The elevations that the topography presents. 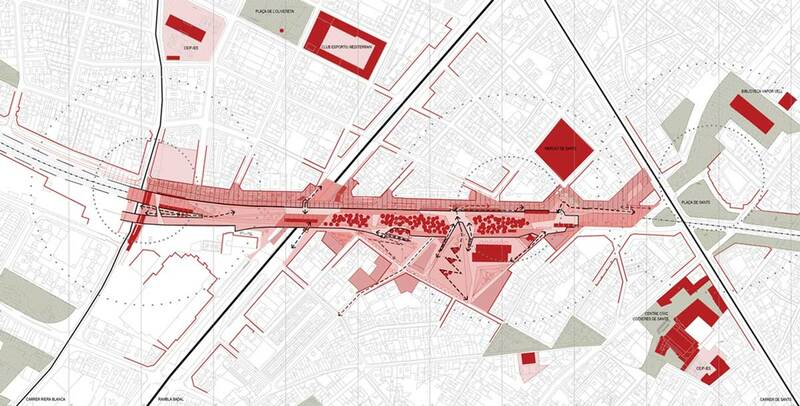 reinforced by the density and the strategic position of the masses of trees. 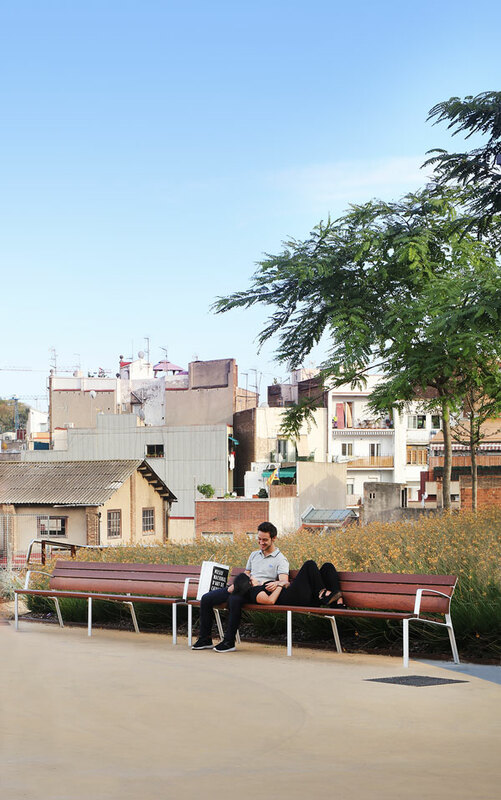 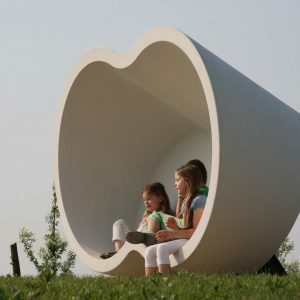 generate areas in which people 1051″5 the sensation of being inside the city and feel like being plunged into a natural environment. 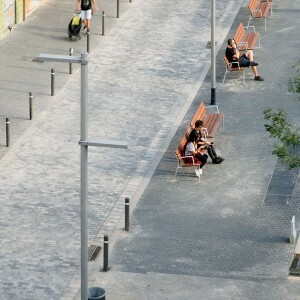 Along this naturalised route there are three spaces which represent the joints. 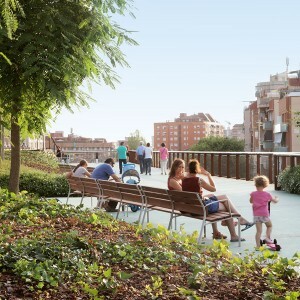 as system of access to the deck. 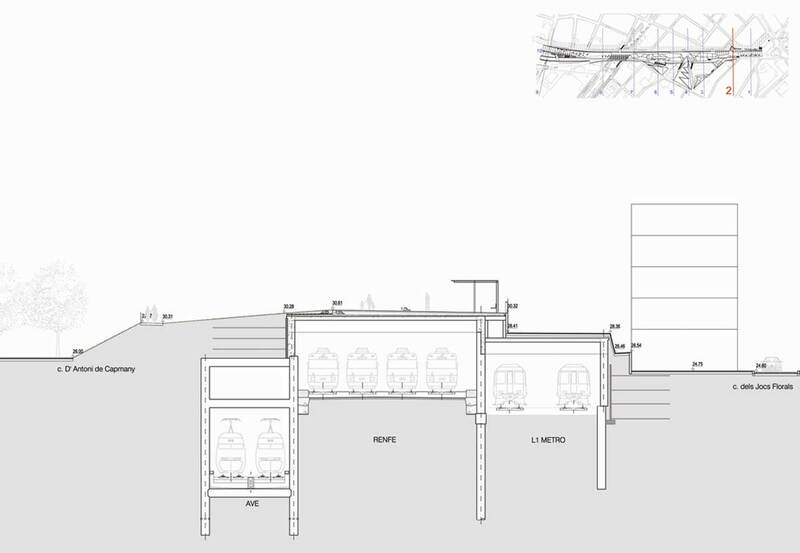 which include: 5 lifts and 2 adapted ramps, 3 stairs and 4 escalators. 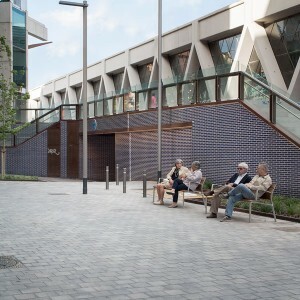 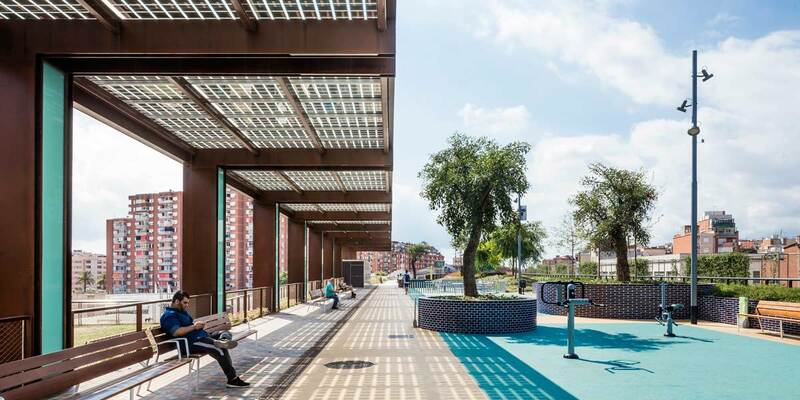 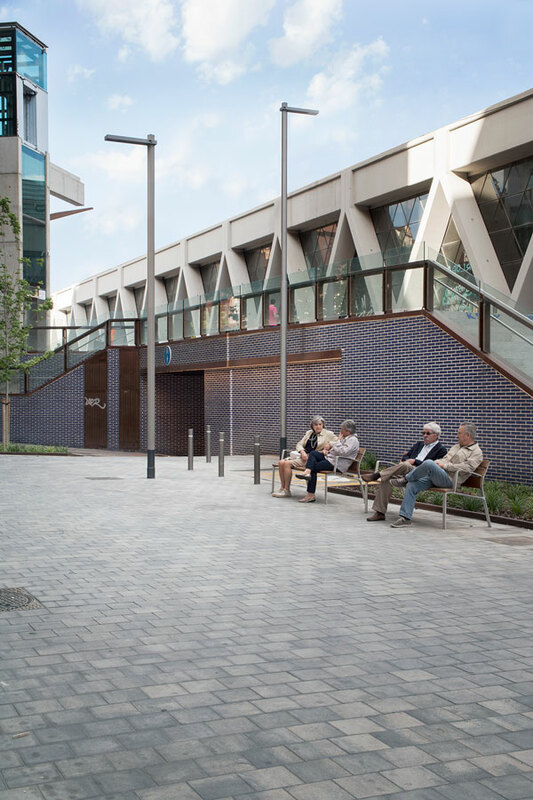 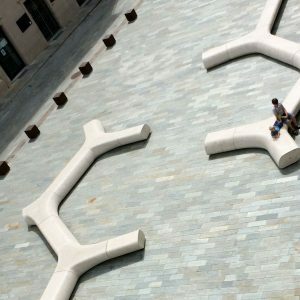 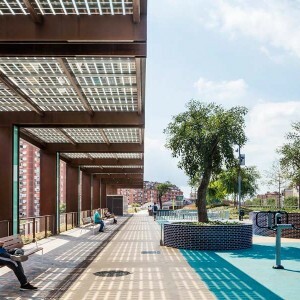 These three spaces disrupt the plant sequence and are characterised by large pergolas that support photovoltaic panels that cover part of the energetic consumption of the roof and generate shade spaces. 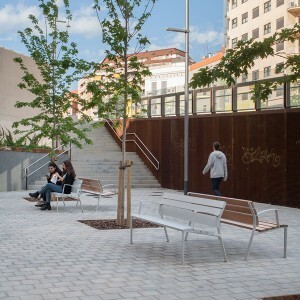 The type of trees used the most are: Tipuanas, Sophoras, Koeleuterias and Malus evereste characterised by yellow and white flowering. 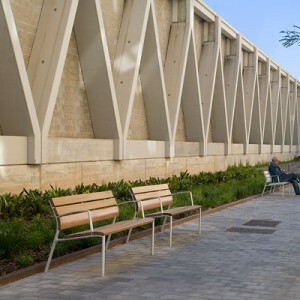 In terms of upholstery and shrubs the plantation has been divided between the lawn, the Bulbine, the red salvia, the wild roses and the Hedera helix in the sunny part with bright and warm colors flowering of bright, and on the shady part, Hedera helix, Vinca, Gaura and the white lantana, accompanying the north route with dark green background and white flowering. 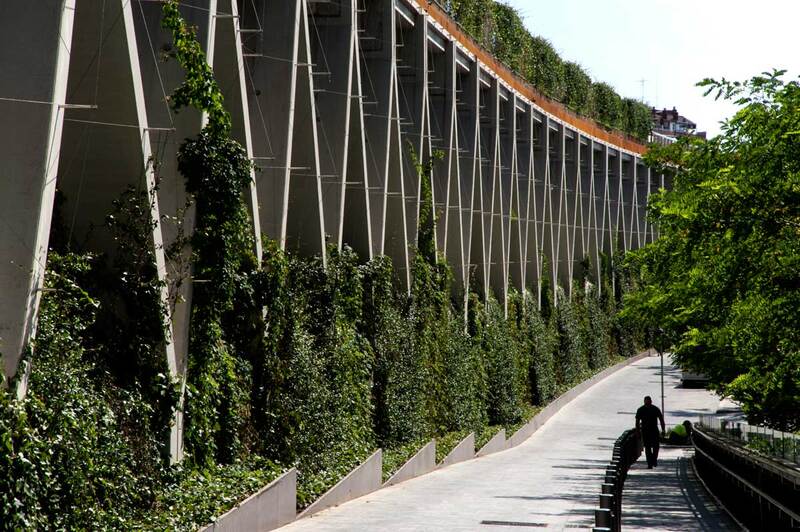 Along the infrastructure facades, climbing plants as Hedera helix, Trasch, Jasminoides, Partenocisus Tricuspidata. 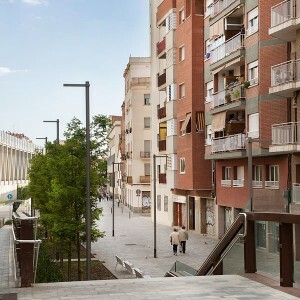 has been places on a cable system that will allow them, in the short term, to cover all the facades except the glazed areas. 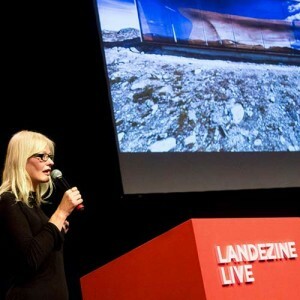 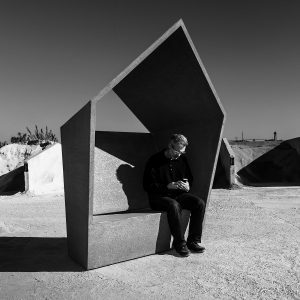 At Santa & Cole they take its responsibility as creators of new artefacts for the world seriously. 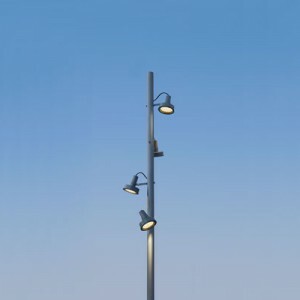 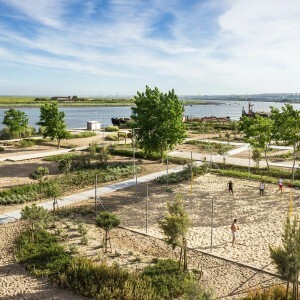 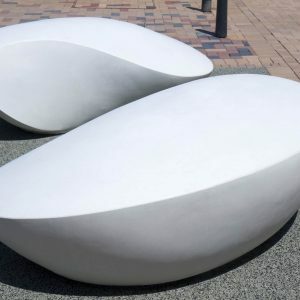 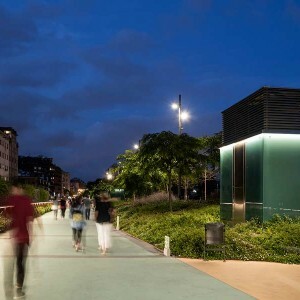 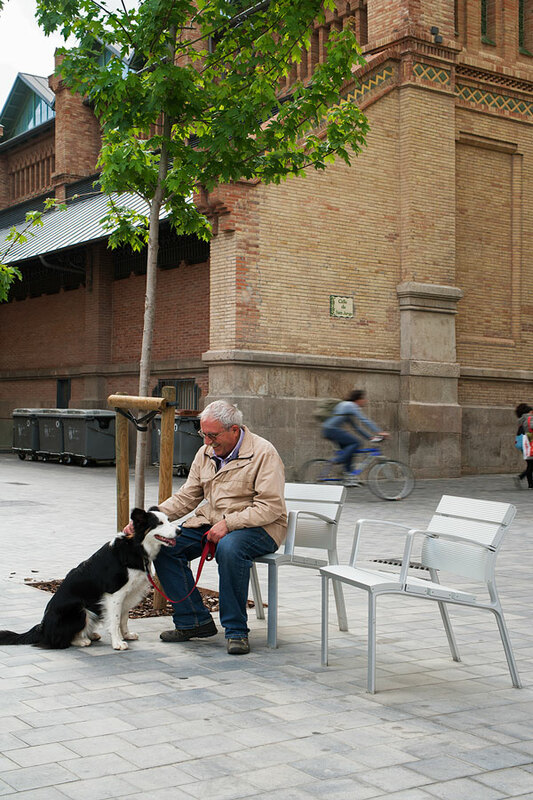 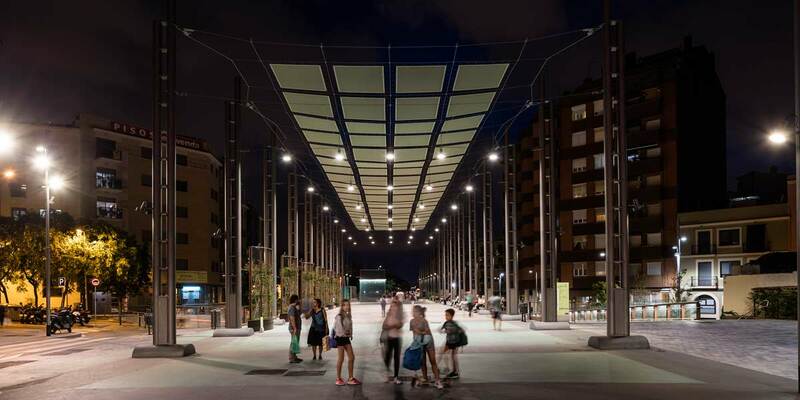 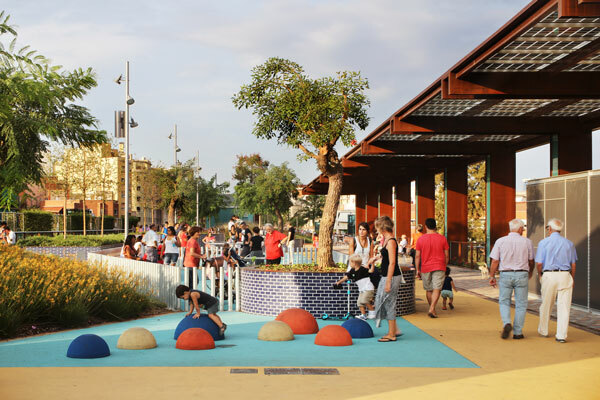 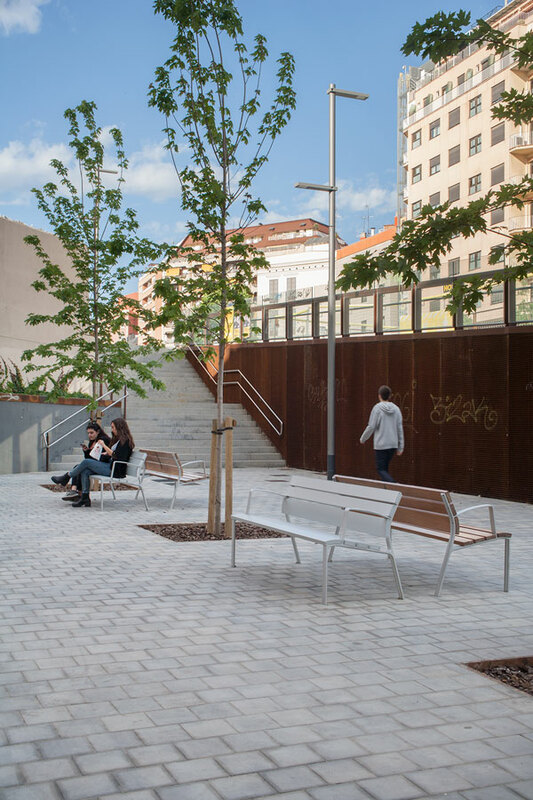 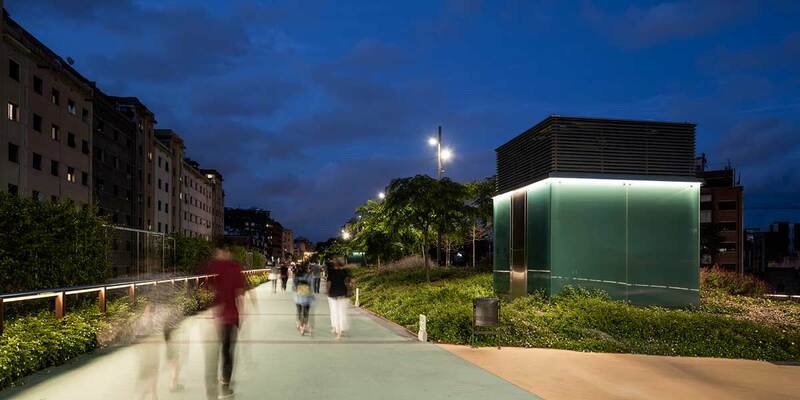 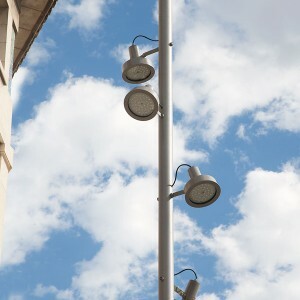 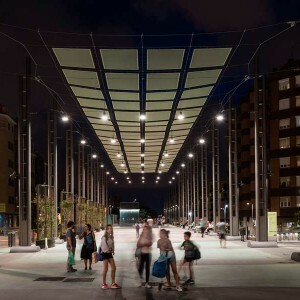 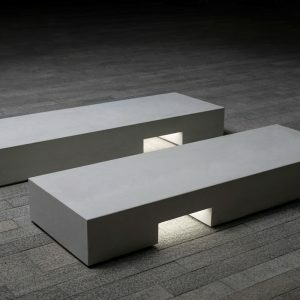 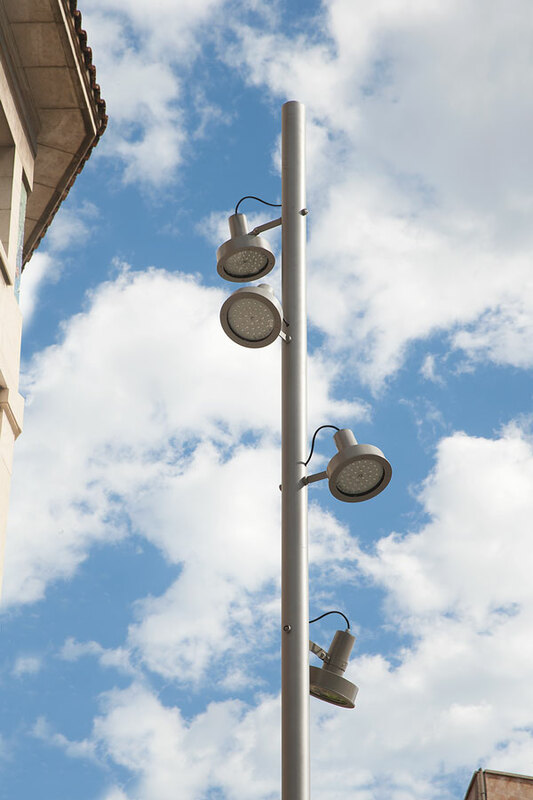 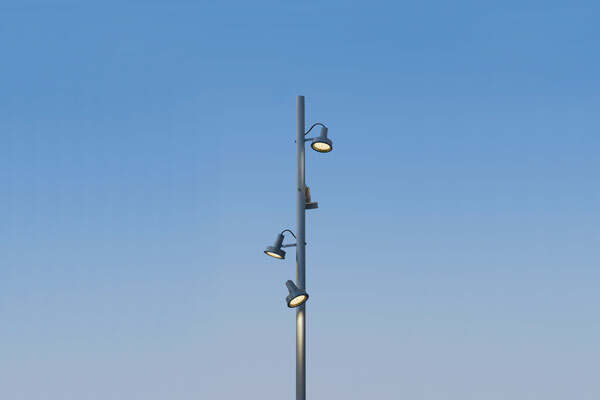 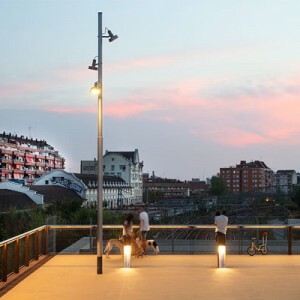 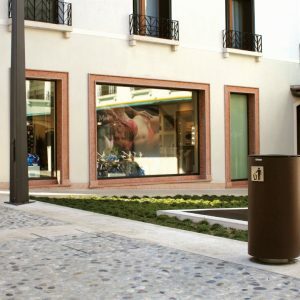 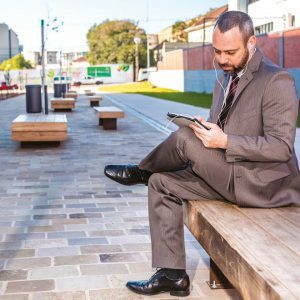 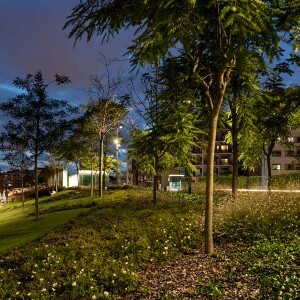 The Barcelona based company edits lighting and furniture for a more friendly, sustainable city that fosters better user experiences and maintenance, in which light, water, rest, safety and information all have a reasonable, accessible place. 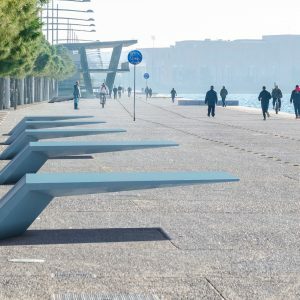 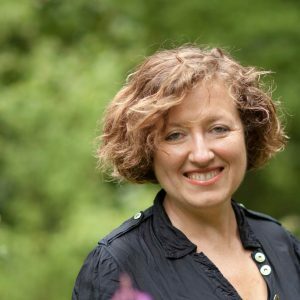 They are honest and lasting, effective functional objects, that excite because they are beautiful and satisfying to people from all manner of cultures. 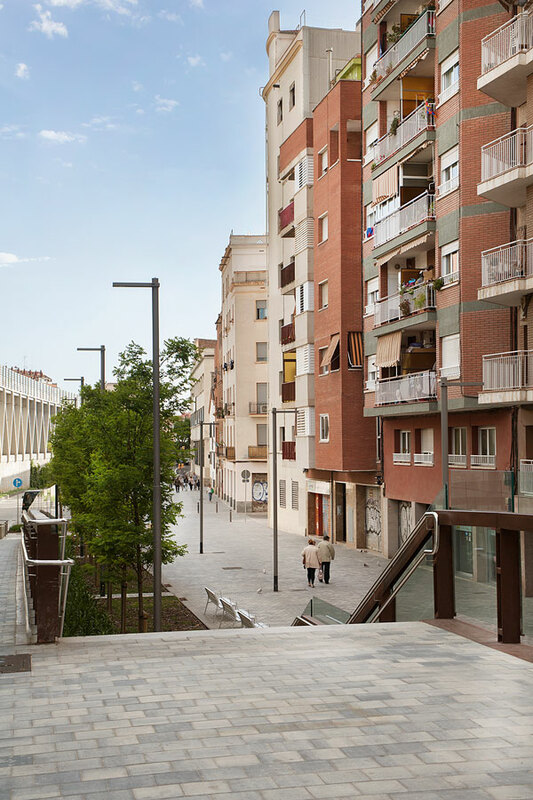 Their quality is immediately recognisable, and they add value to the lives of all those who use them, contributing to more harmonious development of the shared territory that is the city, that is also our home, everyone’s home.